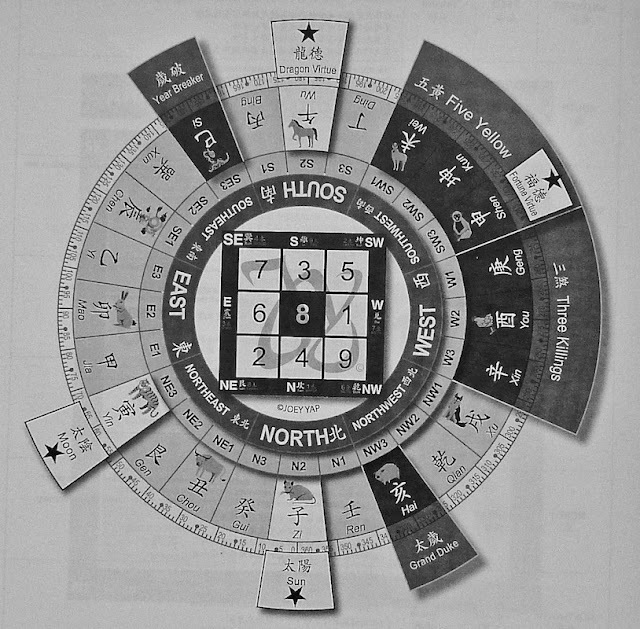 In this final part, I will share a little on the Flying Star Feng Shui for 2019 and also on the dates and times for activating the four major auspicious stars. If you have not read Part 1 and Part 2, you may click on the links to read them before proceeding with Part 3. Note : All images in this post are taken from the seminar's booklet. The Five Yellow in the South West is the most dreaded sector this year. Make sure you keep this area quiet. No drilling, renovation, moving of furniture or nailing the wall here. You can reduce the bad effects simply by placing heavy metal objects here. And also, you can activate the good stars (read below) so that the positive effects will lessen the negative effects caused by this dreaded Five Yellow. The Illness Star in the North East can be mitigated by placing heavy metal objects here. Try not to activate the energy in this sector by avoiding renovation in this area. The Three Killings in the West is also another sector that is not to be disturbed with any type of activities. However the West this year is a good area to increase your chances of finding noble people, as such you should spend more time here. Just do not do any renovation, digging, drilling etc. that could activate the Three Killings. In 2019, it's most beneficial to spend more time in the North, North West, East and Centre. North sector is particularly good if you are studying or learning new things. East and North West are good for career advancement. The Centre is good for increasing wealth. Here are the dates and times to activate the four major auspicious stars in 2019. Animals in brackets means clash - if you have the animal signs in your Bazi Chart, activating the sector may not bring beneficial effects. Due to the Five Yellow in the South West, it is advisable not to activate this Fortune Virtue star. If you have not read Part 1, please click HERE. This year, I am keeping my blog posts short and simple. Most of the things that I don't share here can already be found on Joey Yap's Thriver's Guide 2019 which is free to download for a limited time. 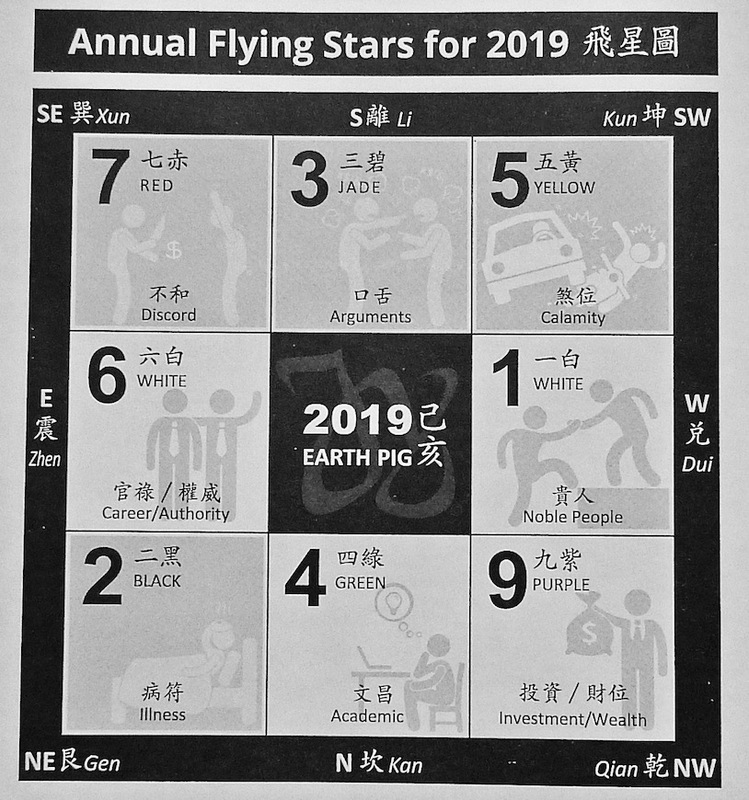 The guide covers the outlook for 2019, the good and bad sectors of your home according to Flying Star feng shui and the auxiliary stars found in each of the 12 animal signs. The information found in the guide are more than enough to help you prepare for the year and probably do some DIY feng shui at home and workplace. However, for more specific and serious problem, you will need to consult a professional feng shui consultant. In Part 2, I will be sharing the activation dates and times for wealth, academic and health. To activate, you can move your furniture, nail the wall, dig the ground or use water feature. Notice that if you have a clash animal sign (which is indicated in brackets) then that time is not effective for you. You will have to choose other dates available. Note : You should face SouthEast with your back facing NorthWest. The person whom you want to discuss to solve the problem should not have Rat in his/her Personal Bazi Chart. Note : You should face NorthEast with your back facing SouthWest. The person whom you want to lock your relationship with must be opposite you and must not have Tiger in his/her Bazi Chart. Note : Your back should face the direction given and the person you are asking for a raise or pitching a business to must not have the animal sign indicated in his/her Bazi Chart. Note : Your partner should not have the indicated animal sign in his/her Bazi Chart. Below are dates and times that would be of interest to you. These are dates that you should not do anything important eg. launch a business, getting married, start a project, move house etc. This is a very important date to take note of. Exposure to a solar eclipse almost always bring bad luck. Joey Yap said that one minute of exposure would result in a year of bad luck, two minutes result in two years of bad luck and so on. Remember that famous news about Donald Trump watching the solar eclipse back in 2017? Maybe that's why he's not doing very well now. Anyway, stay safe and get indoors during the solar eclipse. Note : These are best dates and times to start your dieting and exercise program. If your Bazi Chart has the animal signs indicated, then it's more effective for you in losing weight. And finally, for those who are celebrating Chinese New Year here are some important dates to take note of.